The July soundShoppe was made memorable by a guest appearance by the “why aren’t they famous” Howard Amb (James Hamblin and Stefan Scott Nelson.) 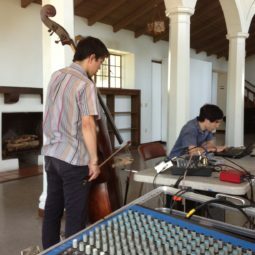 They accompanied Sandy Yang (Red Krayola, Lady Noise) and together created a sort of reduced volume power trio. Sandy was experimenting with a mini “popcorn” snare that she hadn’t used before. Stefan coaxed ethereal and demonic sounds from a new Electro Harmonix V256 Vocoder that he was just getting to know his way around. James dusted off his war horse, a Microkorg and did things I am sure the engineers at Korg never intended. We were joined by two first-timers to soundShoppe who were warming up to play their first show together later that night. They jumped right in on upright bass and laptop. The resulting blend was really quite amazing. I guess the cliché is that what it takes to play improvised music is the ability to listen. I think sometimes people assume listening is paying attention, but in this instance it seems it is more like climbing into the other player’s heads, a mind-meld. These five were melding all over CFAER. It was a great day and an honor to spend James’ birthday with him at soundShoppe. Categorized: The Potts Report. Tagged: soundShoppe. Nicely put Joe! I had a great time. It was a very nice blend. More of this should be happening. Thanks for putting us all together. However you forgot to mention what you were doing, no you are right not to mention because it was indescribable. Thanks to you and all at SASSAS.